One of the many factors stacked against the small woodland owner is that of the economics of scale. 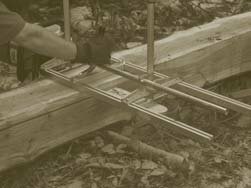 The two, or three trees felled annually just do not warrant the cost of a mobile mill, or having them carted off to one of the few remaining saw mills. One such solution is a chainsaw mill, cheaper, easier to use and more mobile than many trailer borne mills. This set up, using a large Stihl chainsaw and a purpose made fence, allows wood to be planked at the spot where it was felled. 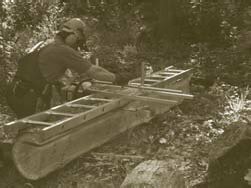 A ladder is used to provide a flat surface for the first cut after which the depth gauge on the fence is adjusted to the appropriate level and by running the saw down the length of the tree, planks are simply fenced off at the set thickness. At Worcester Woods Country Park we have around 40 hectares of Oak woodland with a hazel coppice under storey, from the evidence available it appears that the wood was clear felled in the early 20th century possibly between the wars. Therefore what we have is a pretty uniform crop of 60 - 70 year old oak, that in the current timber market, has such a low value as to make it barely worth harvesting, a problem faced by many woodland owners. However in a busy Country Park (approx 225,000 visitors a year) what we do have is demand for timber, so rather than buying in pressure treated softwood, the chainsaw mill has enabled us to harvest our own timber which we have used around the park for a range of benches and a boardwalk. As a tool the mill has its limitations, but if kept sharp and well maintained it can be a highly useful and innovative piece of equipment that allows the utilisation of an otherwise low grade resource into a much ‘value added’ product.